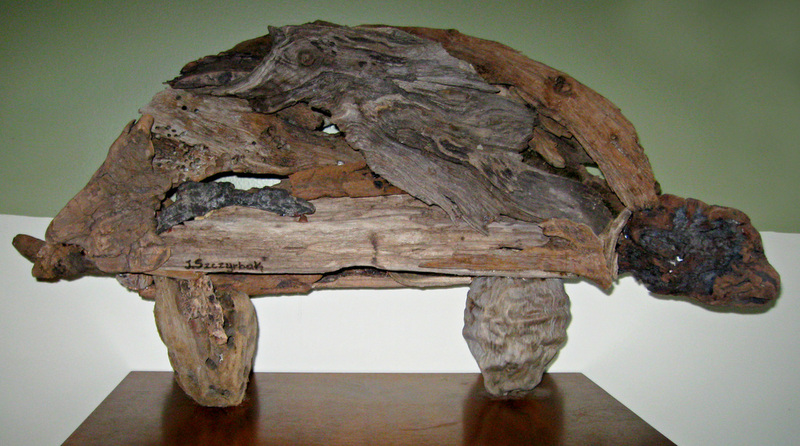 Where there are oceans, lakes and rivers, there is generally driftwood to be found. 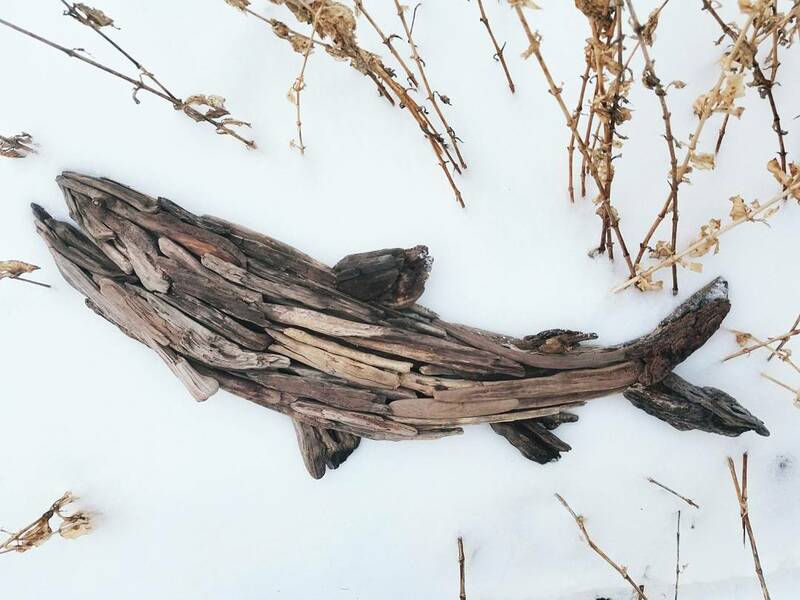 Living in the Land of 10,000 lakes, driftwood is easy to come by. The discovery of this natural resource has become an excellent opportunity for me to combine my creativity and love of treasure-hunting to piece together unique works of art. ART FOR SALE! 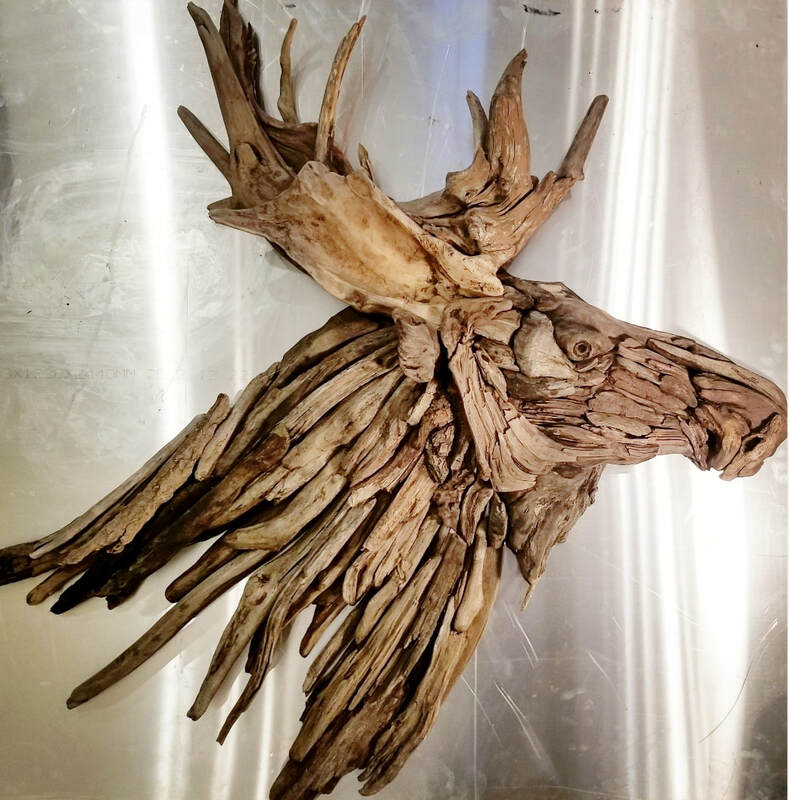 Lake Superior Driftwood Moose Head. 2D Wall hanging. $1,800. Approximately 4' x 4'. 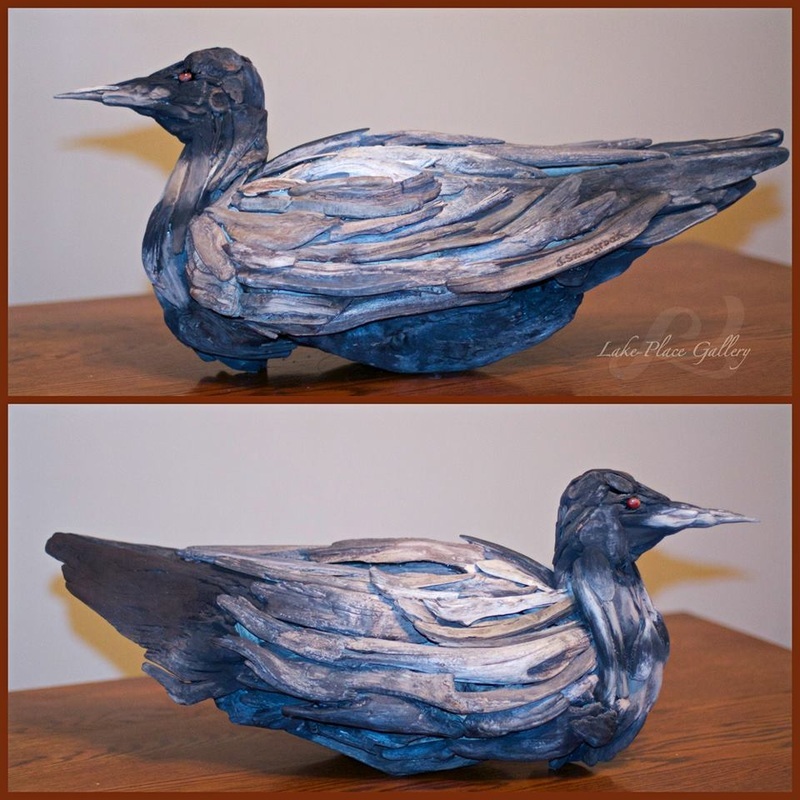 Contact me at Lake Place Gallery Creations for more information. SOLD! 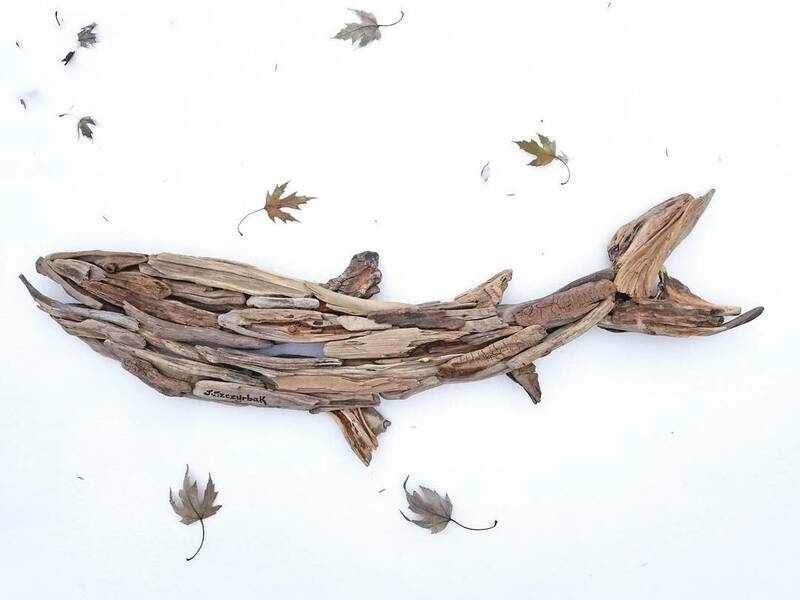 Driftwood Loon. Commissioned 3-D piece. $1,100. 28 inches long. SOLD! Driftwood Walleye with white agate eye. Commissioned piece. $800. 35 inches long. SOLD! 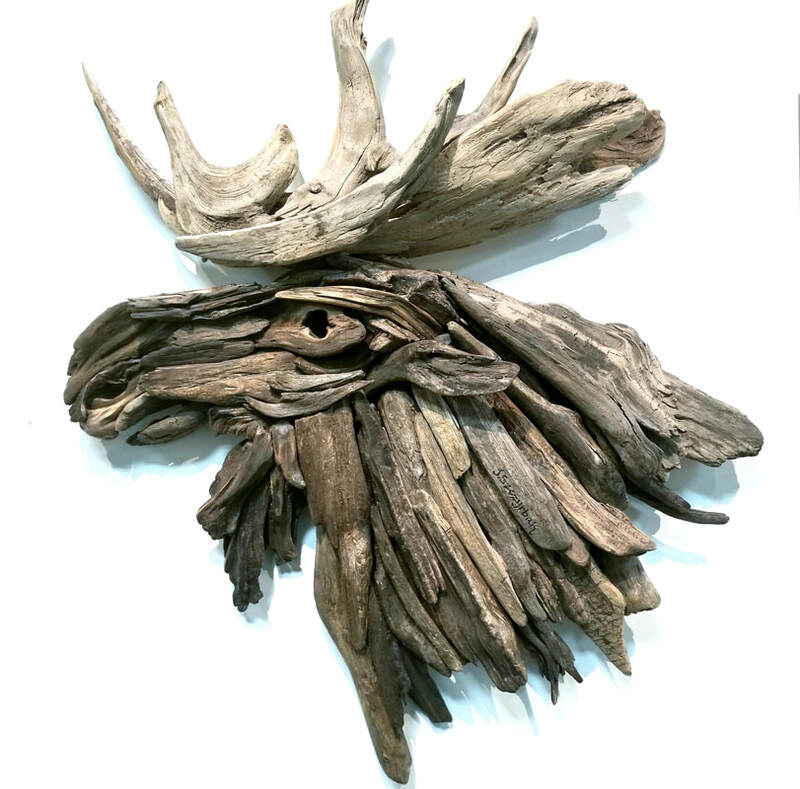 Driftwood Moose Head $1,800. Approximately 4'x4'. ART FOR SALE! Lake Superior Brown Trout $700. Approximately 3' long. 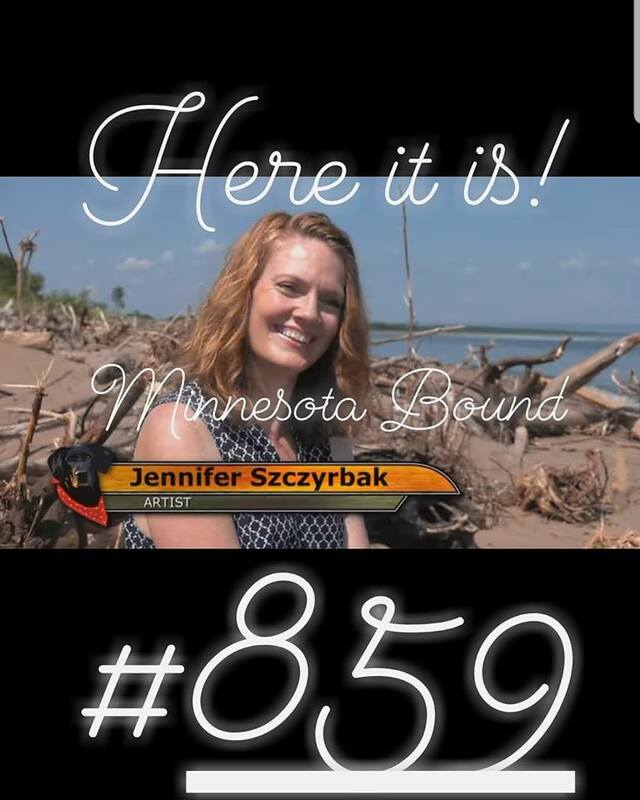 (Currently shown at Lake Place Gallery, 188 Lakeshore Drive, Moose Lake, MN) 218-485-4907. Great Lakes Sturgeon $1,200. Approximately 5.5' long. ART FOR SALE! 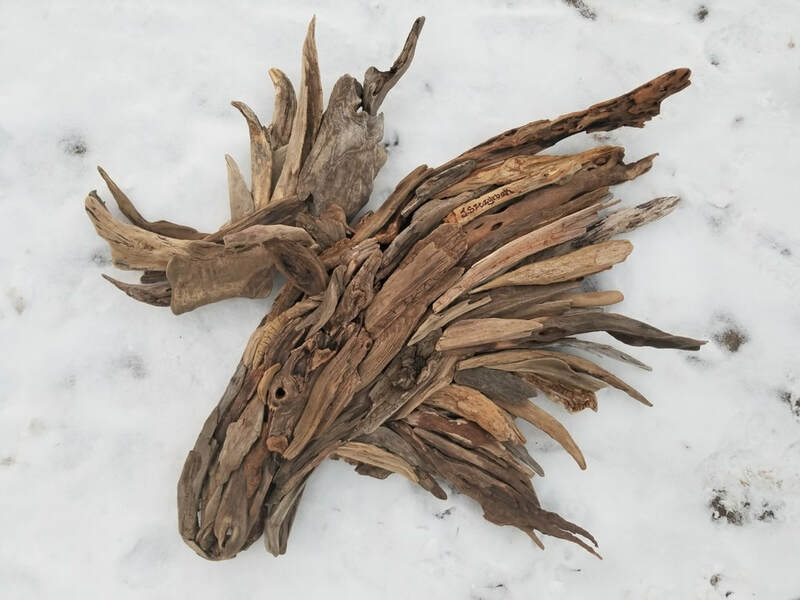 Large Driftwood Running Wolf: This is my latest piece. 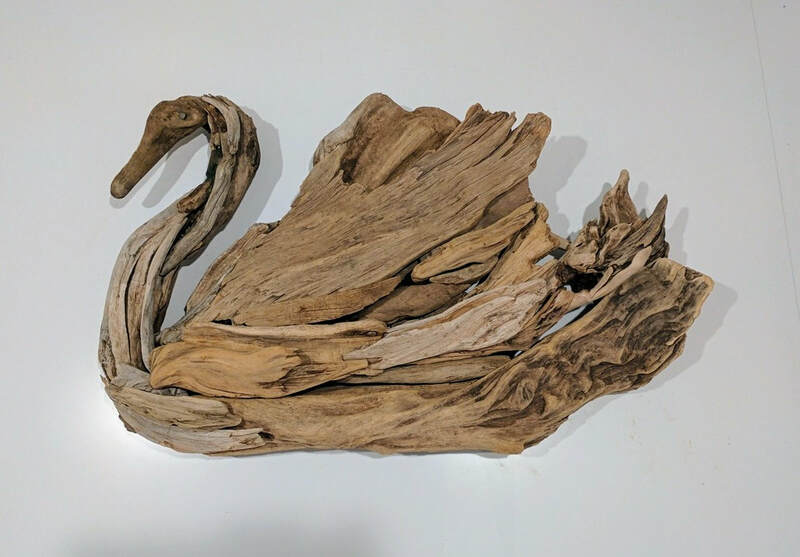 Made entirely of driftwood with some special pieces I found on the Marco Islands in Florida. The tail is comprised of some of those pieces. This is a LARGE wall-hanging and stretches 7 feet wide! This highly original piece would be ideal for someone with large walls, or a Northland business entrance. Perhaps you are wanting to make an impact on people when they see your place, perhaps you love wolves. Here's one for you! 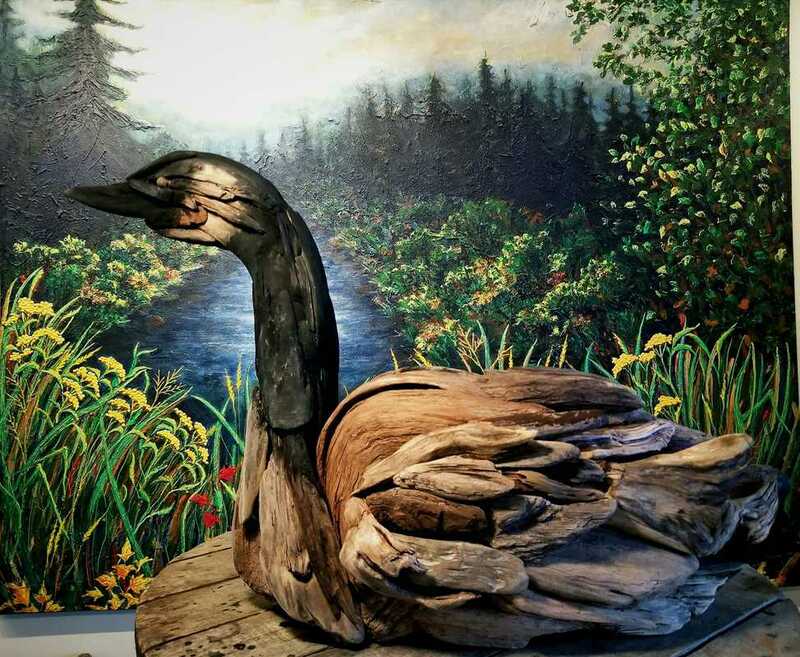 Displayed at Lake Place Gallery, Moose Lake, MN. SOLD! Large Black Bear with Trout. 68 inches wide. SOLD! Large Walking Bear. 5.5 ft. wide. SOLD! Large Wolf Howling at the Moon (Driftwood and birch bark) 5 ft. wide. SOLD! Walking Moose. 6 ft. wide. SOLD! Large Full Sized Alligator. 9 ft. long. SOLD! Large Driftwood Fox~ An intelligent, beautiful creature with flowing tail and sleek frame whose silent swift feet travel alone. SOLD! Running Wolf. 6.5 ft. wide. This is an approximate price, dependent on size, availability of material and time. These pieces are between 2' and 4' in dimension. SOLD! 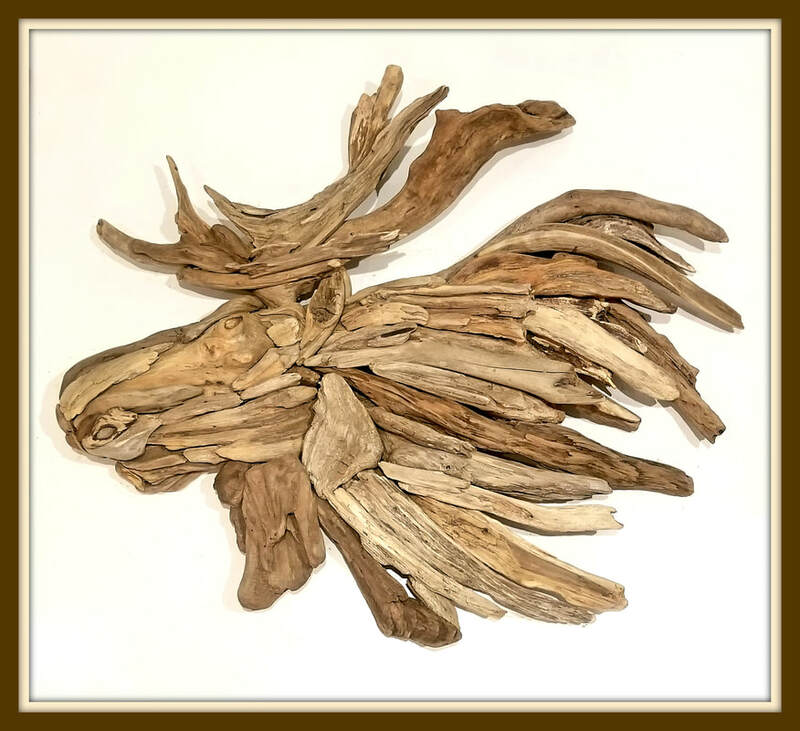 Lake Superior Driftwood Moose Head. 4'x4' wall hanging. $1,800. SOLD! Large Moose Head. 4'x4' wide. SOLD! 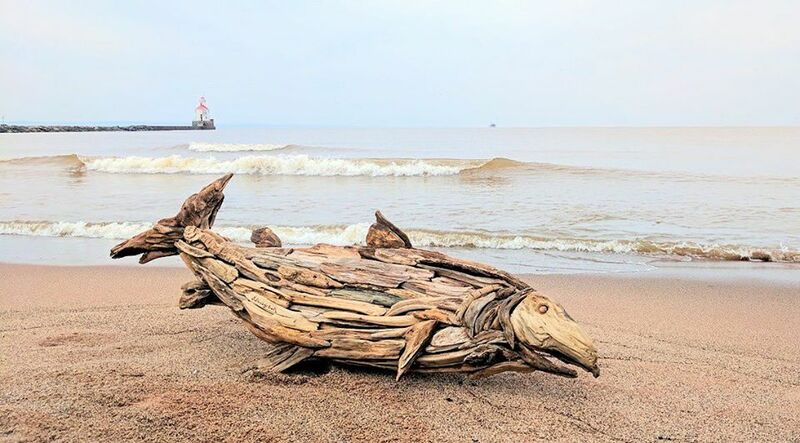 Driftwood Salmon. Approximately 4' wide. SOLD! 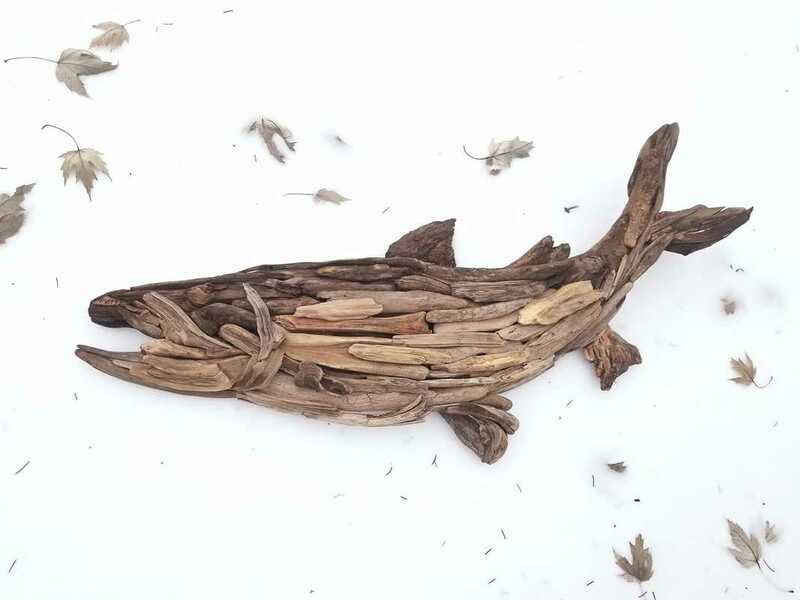 Driftwood Loon. Approximately 2' wide. SOLD! Trumpeter Swan. Approximately 3.5' wide. SOLD! 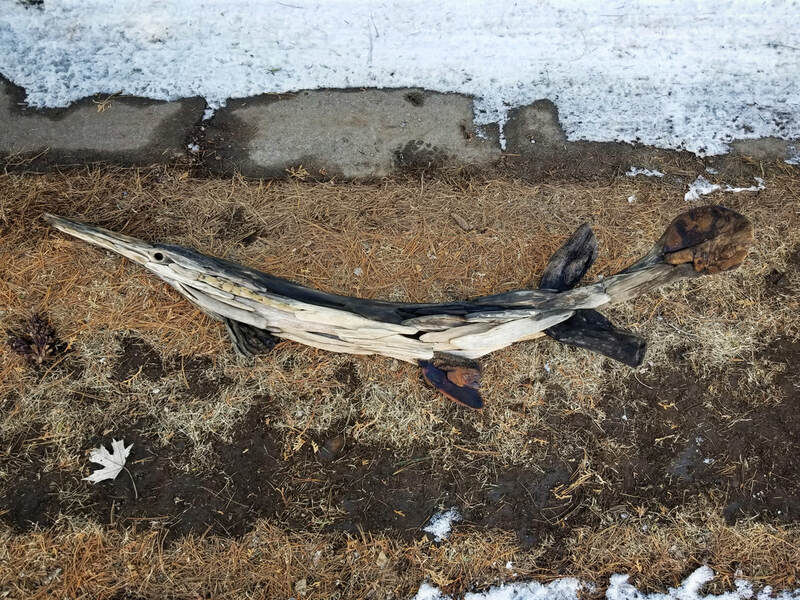 Medium Driftwood Northern Pike. SOLD! 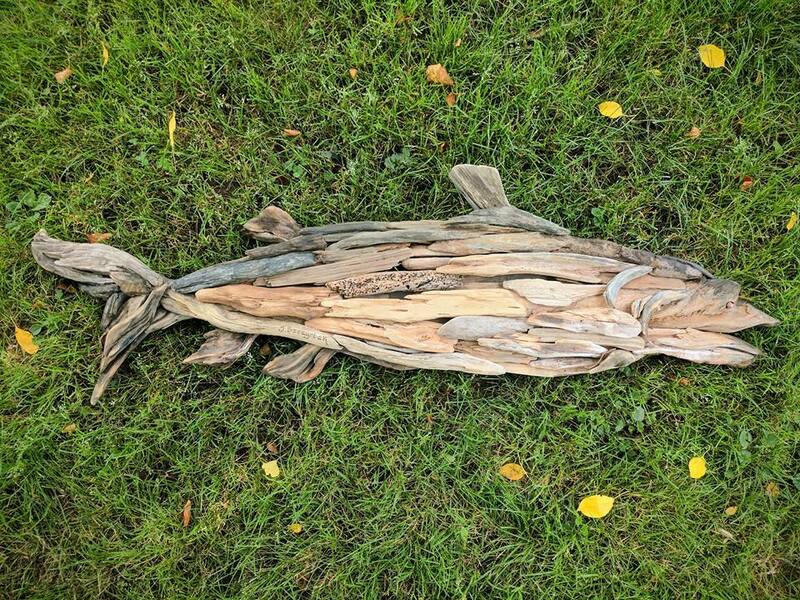 Driftwood salmon. Approximately 4' long. SOLD! 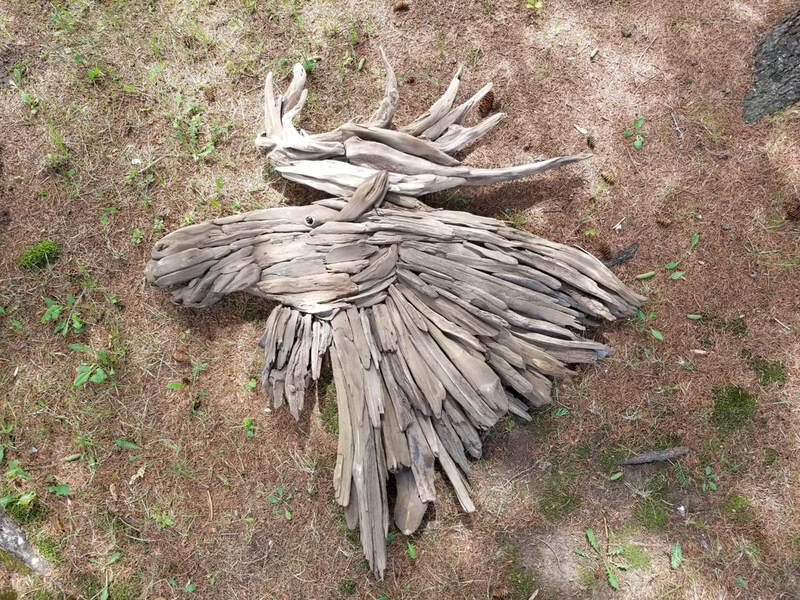 Driftwood Eagle. Approximately 2.5' wide. SOLD! Driftwood Lion Head. 1.5' wide. SOLD! 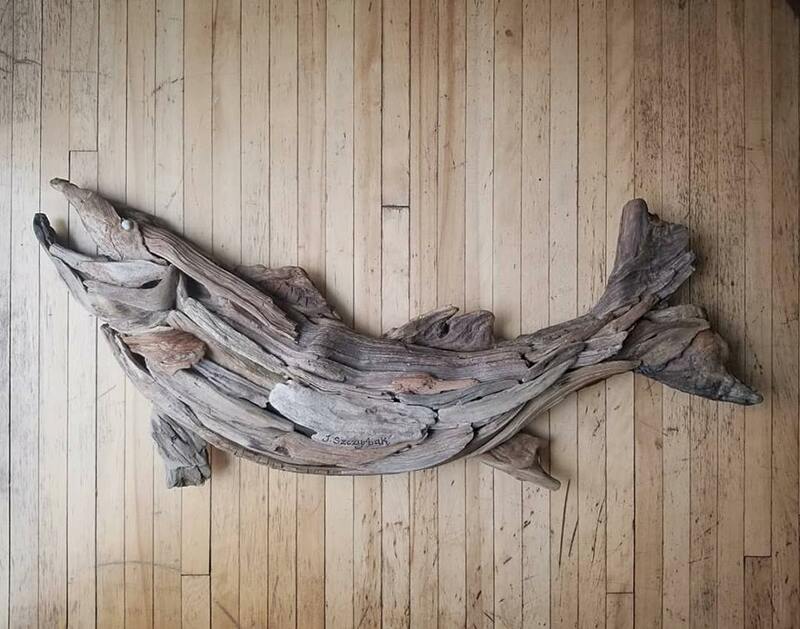 Small Driftwood Perch. 29 inches. Displayed at Waters of Superior, Canal Park, MN. SOLD! Driftwood Horse Head. Approximately 2.5' long. SOLD! 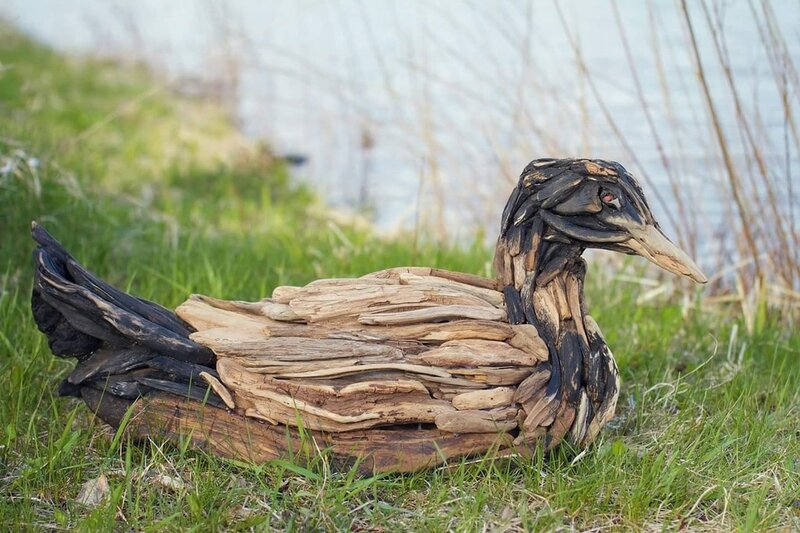 Driftwood Ostrich. Approximately 2.5' wide. SOLD! Driftwood Baby Elephant. Approximately 1'x 1.5'. SOLD! 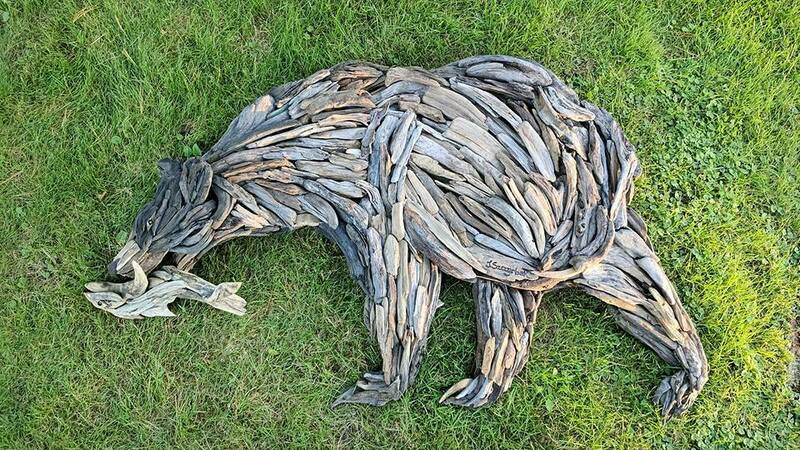 Driftwood Bear. Approximately 3' wide. SOLD! Driftwood Deer Head Approximately 2' tall. SOLD! 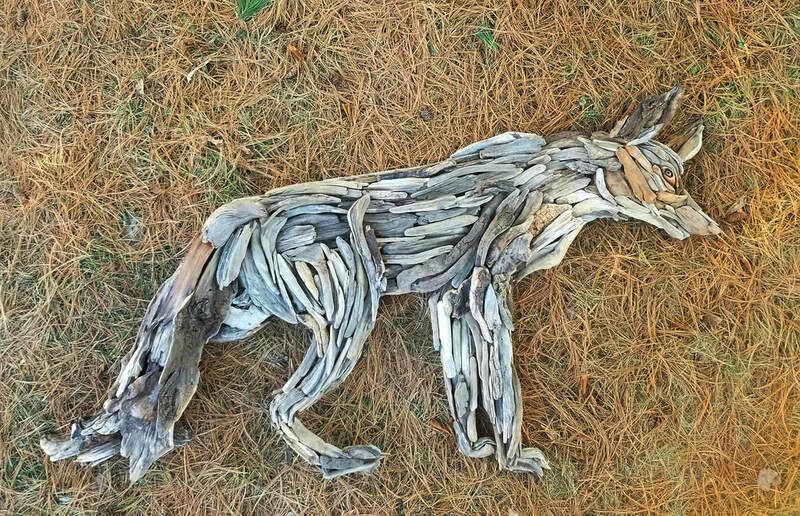 Driftwood Fox. Approximately 2.5' tall. SOLD! Driftwood Horse Head Approximately 1'x1'. SOLD! Driftwood Horse Head. Approximately 2'x2'. 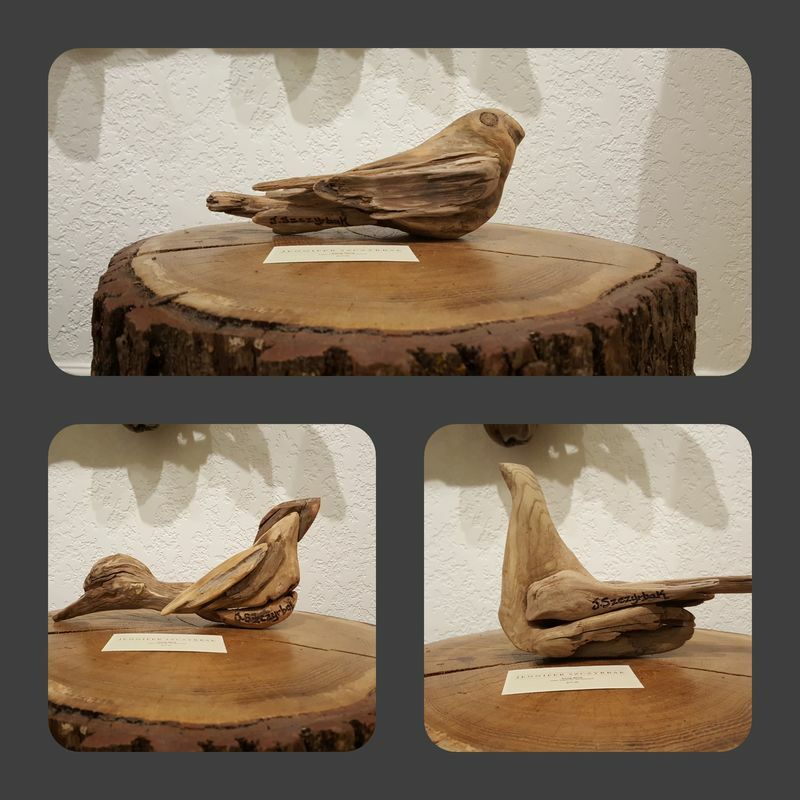 Price depends on the size, materials and availability of driftwood pieces. SOLD! Driftwood Bass. Approximately 18" long. SOLD! 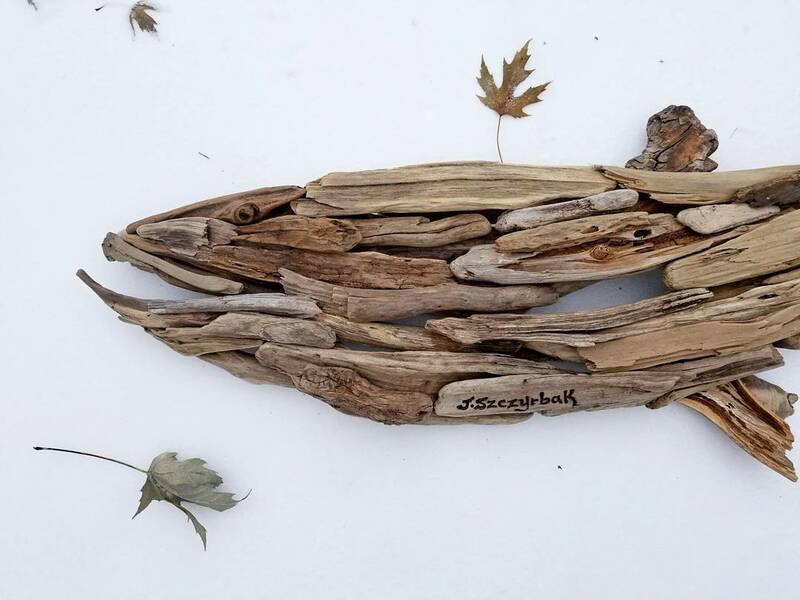 Driftwood Trout. 26 inches long. SOLD! Driftwood Horse Head. Approximately 18" wide. SOLD! 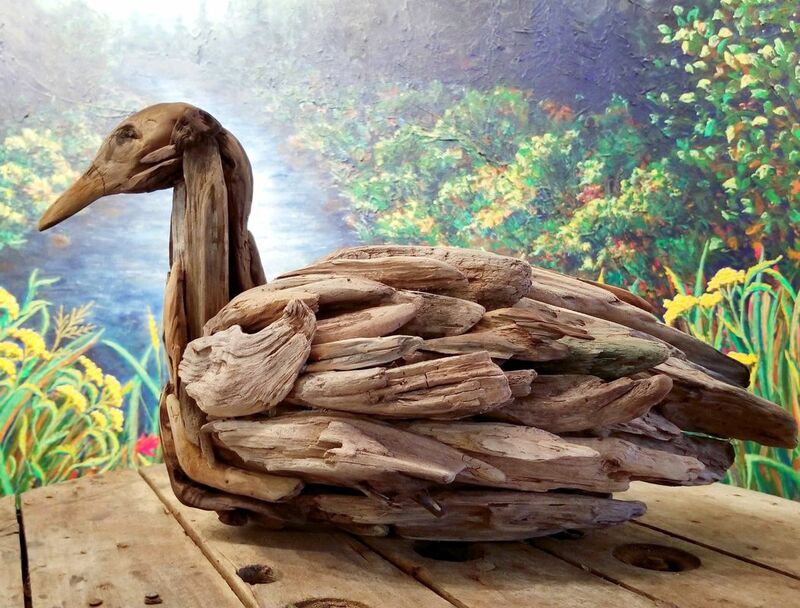 Driftwood Goose. Approximately 18 inches wide. SOLD! 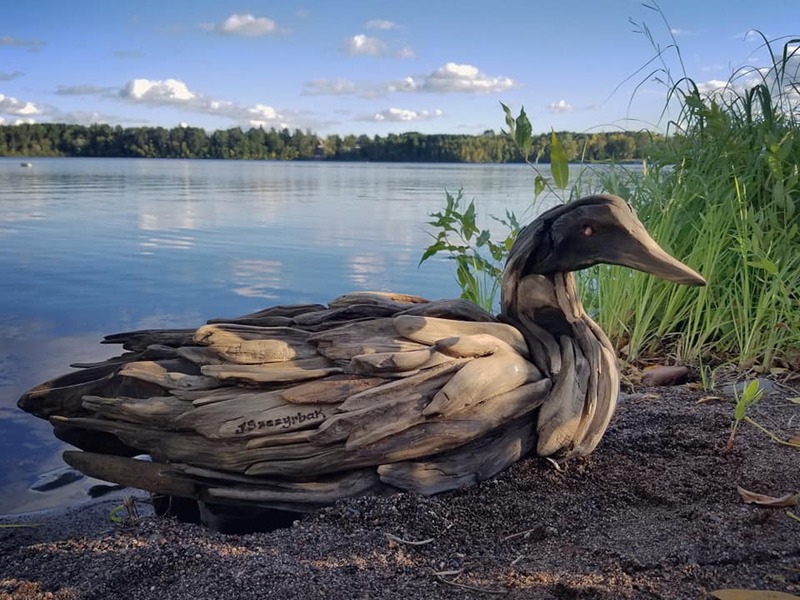 Driftwood Loon. Approximately 12 inches wide. SOLD! 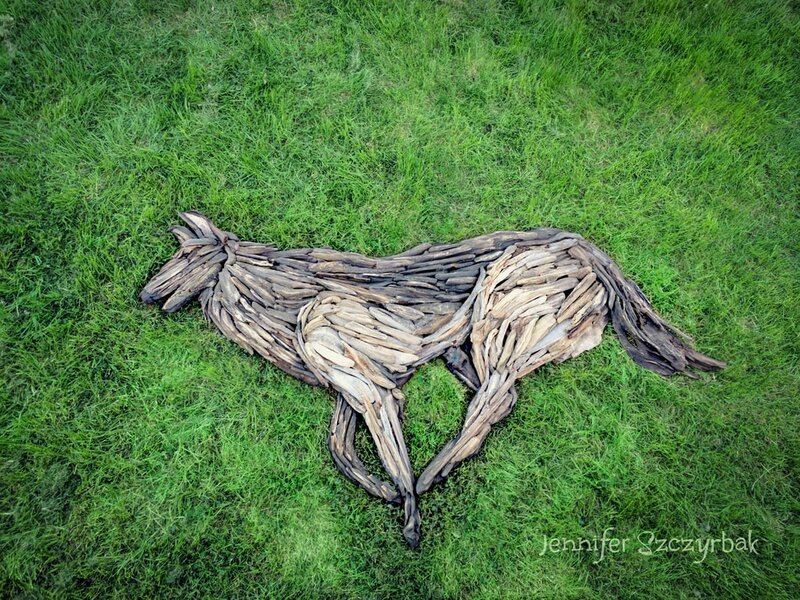 Driftwood Horse. Approximately 10" wide. ​Driftwood Songbirds. Approximately 6-8" wide.